Map and explanation about getting a Russian Visa in Tallinn Estonia. I am making some progress on trying to figure out how to get an Invitation and Visa to Russia quickly and simply. I met a very good traveler, level head and makes good decisions in Riga, Latvia who was on his way to Tallinn, Estonia to get a Visa to travel to Russia. 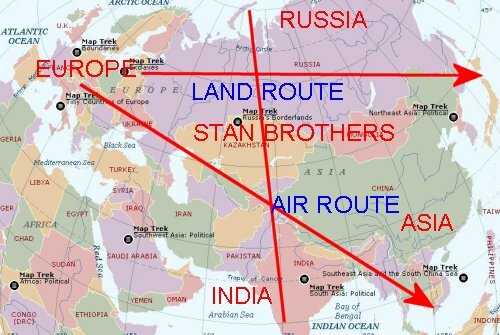 For sure the easy way to enter Russia is from the West side or the Europe side, the Mongolia, China side is just ridiculous unless you already have your Visa from your home country, getting your Visa in Asia is too difficult and very to expensive. This is great, I am trying to figure out how to travel across Russia with the least amount of headache, and Tallinn is a great place to hang around for a week while I get a Visa. 2. Go from Finland or Estonia across Russia, to Mongolia, to Peking, China by train. 3. Land across the Stan Brothers. 4. Lower route across Iran, Pakistan, to India, up across Nepal and over from Lhasa to wherever.